Jupiter, FL, November 9, 2013 – Southern Maryland manager Mike Steinhauser was right to be concerned. 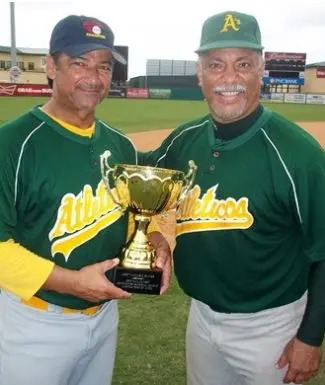 His team’s championship game against the Puerto Rico Athleticos may have been decided before the first pitch was even thrown. With Frank Watsonback on the mound just days after a dominant performance in a 10-4 round-robin victory against this same Puerto Rico team, the result was nowhere near the same. The Athleticos made all the correct adjustments and finished an impressive tournament with another impressive showing in a convincing 13-3 victory. The Athleticos, who finished round-robin play 4-1 and defeated the High Hatters 13-2 in a playoff game, blew this one open with a trio of big innings. They scored four in the fourth, five in the seventh and added three more in the eighth, finishing with 19 hits. That was more than enough for Miguel Rivera (2-0), who allowed three runs over eight strong innings and shared tournament MVP honors with Angel Gonzalez. On the few occasions he did get in trouble, Puerto Rico was there defensively to bail him out. Despite committing three errors, the Athleticos turned four double plays, including a 1-2-3 gem with the bases loaded and none out in the eighth to quell Southern Maryland’s final rally. “I just came out here and prepared nice and easy,” Rivera said through an interpreter. “In this tournament, every team has a good offense, so I prepared mentally to beat them one by one. Mike McGlaughlin’sRBI single tied the score at one in the bottom of the first, but twice Southern Maryland failed to take the lead by leaving a runner on third. By the fourth, Puerto Rico made the Titans pay. Combining bunts with RBI singles from Victor Martinez, Victor Acevedo and Garcia – who finished with three hits and four RBI – the Athleticos took a commanding 5-1 lead and chased Watson.Luis Diaz’s bases-clearing double highlighted a five-run fifth, before Garcia and Luis Lara drove in Puerto Rico’s final runs in the eighth. The title put to rest memories of losing in the 2012 championship game which had been a motivator for nearly a year. “This was a result of really hard work in Puerto Rico by all of us,” Garcia said. “We wanted to get back here and win this time and, because we’ve been together since February, it all came together today. Martinez and Lara joined Garcia with three hits, while Ronald Berrios added a pair of hits for Puerto Rico. Spike Slater and McGlaughlin each had two of Southern Maryland’s nine hits. The Titans reached the title game by finishing round-robin play 4-1, then riding a complete game from McGlaughlin and 3-for-4 efforts from Fernando Villegas, Alex Brunet, Slaterand Russell Unilowsky to beat the Salty Dogs 4-2 in the playoffs.